Welcome to Trestar Elektroniks, Manufacturers and Exporter of Electric Wires, Cable Sleeves, Coaxial and Triaxial Cables. The company was incepted in 1983 at Hyderabad. Our products are applicable in Hospitals, Clinics, Private medical institutions and Nursing homes. We are backed by advanced quality testing center, Hi tech processing Unit and Sound financial background. We offer a huge gamut of PTFE Hook up Wires, Sleeves and CORONA Resistant Cables. 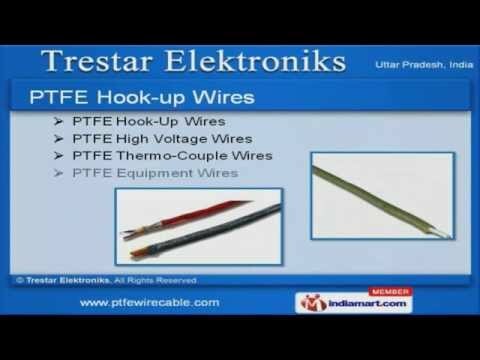 PTFE Hook up Wires offered by us are well known for their durability. Our PTFE Cables and Films are reckoned all over the world for their superb quality. Our organization is highly involved in providing an impeccable range of PTFE Sleeves that are a class apart. We have expertise in offering PTFE Tapes that are one of the best in the market. Our CORONA Resistant Cables are widely appreciated in the market.